BEAUTIFUL BABY POWDER SMELL WAFERS TO INSERT IN YOUR BABIES BODY TO CREATE THE WONDER BABY BODY SCENT ASSOCIATED WITH NEWBORN BABIES. These little wafers pack a punch - the aroma fills the room. Placed one in the downstairs cloakroom, and the sweet aroma is still going strong I month later!! Fabulous scent from these wonder wafers. They fill a room with a lovely aroma, I can even smell them in the wardrobe, where they are kept. Lovely just to have in a room instead of pot pourri. 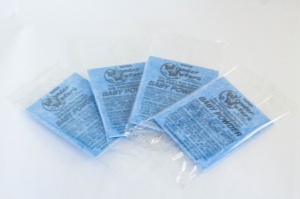 Love these, I put in the Reborn's for that baby powder smell, very good value. I always get really good feedback on how lovely my reborns smell using these.